Mo thuiscint ná nach bhfuil gá ach an téacs a aistriú agus cúpla cóipeanna crua a chur ar fáil agus go mbeadh leagan leictreonach ar fáil don chuid eile. Mar sin nach mbeadh príomhchostas na tuairisce ag baint leis na huaireanta a chaitear ag ullmhú an tuairisc bhliantúil as Béarla agus na céadta/mílte cóip a chur i gcló i mBéarla? Slí níos éifeachtaí chuige seo, ná a.daoine le Gaeilge a chur ag ullmhú na tuairiscí go dátheangach (agus proifléiteoirí a íoc [níos saoire ná aistriú]) nó b. breiseoiliúint Gaeilge a thabhairt don fhostaí reatha gan Gaeilge chun go mbeidh siad ábalta na tuairiscí a chur ar fáil sna dhá theanga oifigiúla. Chomh maith, mo thuiscint ná go mbeadh na comhlachtaí poiblí ag fanacht go dtí go raibh gá le hordú mór staiseanóireacht nua a ordú isteach agus go mbeadh roinnt blianta acu chun ullmhú chuige seo. Nár luaigh Ó Cuív sin i roinnt ailt/agallaimh nó an bhfuil mé mí-cheart? Chomh maith nach dtarlaíonn amhlaidh san earnáil phríobháideach go leanúnach nuair a cheannaíonn comhlacht comhlacht eile: Zurich; Royal Bank of Scotland, srl. Is é lom na fírinne ná go bhfuil cogadh bolscaireachta ar siúil i gcónaí agus go bhfuil lucht na léite gorma agus frith-Ghaelaithe sásta cibé bréag is riachtanach a rá. Bréag – nó aineolas – atá san ráiteas sin. Bhí tréimhse ama luaite leis na rialacháin i léith staiseanóireacht, chun go mbeadh an sean stoc ídithe sula raibh dualgas ar aon chomhlacht cinn nua a cheannach. Sin an rud faoin díospóireacht seo – tá an oiread aibhéil agus glan bréaga á scaipeadh faoi cad tá nó nach bhfuil san Acht, agus cén fíor chostas a bhaineann leis, go mbeadh duine ag caitheamh an t-am ar fad ag iarraidh na bréaga, atá bréagnaithe fiche uair cheana, a bhréagnú. Ní bheidh díospóireacht ionraic ann faoin nGaeilge ar na cuinsí sin. Tá an dream ar thug Breandán Ó hEithir an F**k the language movement fós linn go tiubh. Agus, is léir, fós ag éirí leo dallmullóg a chuir ar sciar airithe de Ghaeilgeoirí ar cheart dóibh bheith ar an eolas. Níl sé chomh deacair sin spléachadh a chaitheamh ar shuíomh na Ranna ná an Choimisinéara. Sí an cheist ná conas an díospóireacht a bhogadh ar aghaidh. Éirí amach na mná tí? Is é croí na ceiste cé acu an bhfuil nó nach bhfuil éileamh agus léamh ar na caipéisí atá á aistriú. Ní chreidim go bhfuil. Creidim gur cur amú é, go h-áirithe nuair atá nuachtáin ag dul as cló agus irisí fónta ar nós nós* gan tacaíocht d’aon tsort ón Stát cé go bhfuil obair an Stáít – cur chun cinn na Gaeilge i measc an óige – ar bun acu. An duine de lucht na léinte gorma mise? An frith Ghael mé? Ní doigh liom é! Ba cheart do GGN cloí leis an riail a bhionn ar Slugger agus a chuid faobhair a dhíriú ar an imirt seachas ar an imreoir. Tá moladh ag Feirsteach, áfach, tabhairt ar an stat seirbhís daoine le Gaeilge a earcú in áit daoine gan ach Béarla acu. An deacracht le sin go bhfuil cosc ar earcú faoi láthair agus go bhfuil an stat seirbhís anois gan Ghaeilge den chuid is mó. Corr eisceacht atá ann. Is é bun agus barr an scéil go gcaithfear dul i ngleic le namhaid na Gaeilge – acu san atá an liathróid faoi láthair. Agus caithfear dul i ngleic leo ar bhonn ciallmhar agus straitéiseach agus féachaint chuige go bhfuil moltaí ciallmhara ann le h-aghaidh cur chun cinn na Gaeilge agus tacaíocht an Stait as seo amach. An bhfuil aoinne amuigh ansin, dá mbeadh an rogha acu, a roghnódh €2m a chaitheamh ar aistriúcháin na n-ionstraimi reachtúla roimh cultúrlann mar is ceart a lonnú i mBAC. I gcead dom, a Chonchubhair níor luaigh mé an focal “earcú” d’aonturas toisc go bhfuil cosc ar earcaíocht san earnáil phoiblí. D’fhéadfadh na daoine seo bheith lonnaithe sa chomhlacht poiblí cheana le dualgais eile, mar sin d’fhéadfadh aistriú dualgais inmheánach tarlú, nó aistriú fisiciúil an fhostaí idir rannóga nó comhlachtaí poiblí (Ranna Rialtais) tarlú, nó fiú rannóg foilseacháin a chur ar bun sna comhlachtaí poiblí/ranna rialtas éagsúla. Tá buntáistí agus mí-bhuntáistí leo seo go léir. nó b. breiseoiliúint Gaeilge a thabhairt don fhostaí reatha gan Gaeilge chun go mbeidh siad ábalta na tuairiscí a chur ar fáil sna dhá theanga oifigiúla. An bhfuil éinne amuigh ansin a cheapann go mbeidh an rogha sin riamh againn? Nó an rogha preaséisiúint as Gaeilge nó seirbhísí ailse in ospidéal reigiúnach? Táimid sa tsuíomh seo ó thaobh na hionstraimí reachtúla de toisc go ndearnadh faillí ar an nGaeilge breis agus 20 bliain ó shin i gcoinne atá ráite sa Bhunreacht. Thóg sé 20 bliain sular tógadh agus sular d’fhorbair an chás cúirte agus bhí sé de dheis, de cheart agus de dhualgais ag na rialtais go léir ó shin an suíomh seo a chur ina gceart agus an reachtaíocht a chur ar fáil sa dhá theanga oifigiúla. Beidh costas ag baint le Baile Bhuirne atá sna milliúin ach b’fhiú sin. Beidh costas ag baint le cuir i bhfeidhm an plean 20 bliana ach b’fhiú sin. Beidh costas ag baint le hÚdaras na Gaeltachta ach b’fhiú sin. Beidh costas ag baint le beagnach gach aon rud a bhaineann leis an nGaeilge (más maoiniú stáit, infheistíocht príobháideach nó brabús ó sheirbhísí/earraí a dhíol). Dá mbeadh an saol ina cheart, agus airgead go flúirseach, ní bheadh argóínt ar bith agam leat. Tá orainn tosaiochtaí a chur in ord agus in eagar agus beartú dá réir. Níl an t-airgead ann – nó ní chuirfear ar fáíl é – le h-aghaidh na nithe atá luaite agat. Tá Baile Bhuirne imithe anois, beidh an t-adh linn má thagann ÚnaG slán agus níl a fhios ag aoinne cad é an chinniúint atá ann do phlean 20 bliain Uí Chuív. An dtagraíonn an 20 bliain don tréimhse a bheidh de dhith chun an plean a fhoilsiú nó a chur i bhfeidhm? Ní gá gur ar lucht na meán is namhaid na Gaeilge an locht as ucht na bréaga is an áibhéil atá á scaipeadh faoi Acht na dTeangacha Oifigiúla. Tá cuid is mó den locht ar an Aire féin as ucht chomh tuatach is chomh ciotach atá sé i mbun cumarsáide. Cailleann daoine réasúnta suim sa bheatha agus iad ag éisteacht leis ag tabhairt freagraí casta ar cheisteanna simplí. Nior dhíol an Aire Acht na dTeangacha Oifigiúla le pobal na hÉireann riamh – ní raibh gá do, chreid sé, de bharr go raibh an oiread sin airgid timpeall trath gur reachtaíodh é gur cuma leis an ghnath dhuine an mó milliún a bhí á chaitheamh ar aistriúcháin. Tá an ré sin thart is tá gach pingin á scrúdú anois. Ní ar an tAire amháin atá an locht, ach orainn ar fad. Agus ba mhaith liom fianaise a fheiscint seachas scéal cailleach an uafáis faoi na “millúin” á chaitheamh ar caipéisí “nach léitear”. Go dtí seo níl ach scéalta dúirt bean liom go ndúirt bean lei foilsithe sna nuachtáin, agus na fíricí curtha as a riocht chomh mór sin iontu nac hbhfuil iontaibh agam as na figúirí. Nach tusa a fuair amach go raibh íoslódáil rábach dá dhéanamh ar phlean Corcaí – a bhí de réir saoithe na nuachtáin gan éileamh? Tá sé ráite go minic agus go poiblí, i mBéarla agus i nGaeilge, ag Éamón Ó Cuív, gur cur amú achmhainní é tuarascáil glossy a chlóbhualadh – go m’bhfearr go mór leis féin iad á fhail i bhfoirm leictreonach, agus diriú ar na codanna is spéis leis. Ar luaigh mé tusa áit ar bith i mo thrachtaireacht a Chocubhair. Níl. An raibh Fitzgerald ag inse bréag? – bhí. An Blueshirt é, is é. Is cinnte go bhfuil roinnt eagraíochtaí stait ag foilsiú tuarascálacha ar phaipéar glossiáilte i nGaeilge agus i mBearla agus go bhfuil costas breise ag baint le sin – ní bréag an méid sin. Is bréag a rá go raibh an dualgas sin ar gach eagraíocht stáit. Ach tá an dhá léamh ar an méid a dúirt Mac Gearailt agus ar mhaithe le cothromas, tá sé ceart sin a rá. Chomh fada agus a bhaineann sé liom, níl sé ceart íonsaí a dhéanamh ar dhuine ar bith anseo seachas go bhfuil bunús le sin san argóint. B’fhearr liom é a sheachaint mas féidir. Mar sin ní bhaineann sé le h-ábhar cé acu mise nó duine eile a bhí á íonsaí agat. Seasann an riail. An imirt seachas an imreoir. Tá an ceart ag Aonghus, thug mé an t-eolas sin faoin íoslódáíl rábach a bhí á dhéanamh ar phlean forbartha Chorcaí. Ní thuigim go fóill an údar a bhí leis an íoslódáil. Gach seans go bhfuil caipéisí i nGaeilge á charnú ag duine nó dream dhaoine sa tír seo. Nior chas mise leo go fóill. An mó caipéis i nGaeilge a loirg aon duine a bhionn anseo go minic? B’fheidir go ndéanfaimid suirbhé beag neamh oifigiúil agus neamh eolaíoch ar an gceist? Níor cheart dóibh ceachtar acu a fhoilsiú ach má tá siad le foilsiú, bíodh siad i dteanga oifigiúil an stáit a deirim féin. Ar chóir go mbeadh an méad sin airgead a chur amu ag cur rudaí in aistriú go Béarla, sin an cheist. Chomh fada agus a bhaineann sé liomsa tá an iomarca airgid á chaitheamh ar mhaorláthas sa DHÁ theanga oifigiúil. Chomh fada agus a bhaineann sé leis an nGaeilge, áfach, níl a dhothain airgid á chaitheamh ar ábhar inléite úsáideach. Ní amhlaidh an scéal leis an Bhéarla mar tá an margadh mór ann dóibh. Tá Acht na dTeangacha Oifigiúla ag díriú na h-acmhainní ganna atá ann don Ghaeilge i dtreo maorláthas seachas i dtreo infhéistiú cuí is ceart a dhéanamh ar leabhair scoile do pháistí i nGaeilge, nó irisí, nó nuachtáin, nó leabhair. Pinginí atá á chaitheamh ar seo i gcomórtas leis an t-uafás atá á chaitheamh ar na gcaipéisí oifigiúla seo. Níl ach feidhm amháin leis na caipeisí seo, chomh fada is a bhfeictear domsa, beathú na mbraithre atá á n-aistriú. Ní feidir teacht orthu chun an t-eolas iontu a fháil. Tá daoine beo i bhfantasaí éigean má chreideann siad go leanfaidh seo. Dar liomsa, bheadh sé i bhfad níos fearr do na Gaeil seasamh a ghlacadh agus a rá gur cur amú airgid atá furmhór mhór den airgead a chaitear ar an maorláthas seo i nGaeilge agus gur fearr i bhfad sciar níos mó airgid a infhéistiú i solathar leabhair scoile is eile. Tá sin mí chruinn. Níl acmhainní de chuid na Gaeilge i gceist. Is as buiséid riaracháin na Ranna Stáit agus comhlachtaí pobail a ghlantar aon chostas a bhaineann le hAcht na dTeangacha a chuir i bhfeidhm. Is ar maorlathas an Bhéarla a chaithfí an t-airgead sin murach an Acht. Má tá acmhainní poiblí á chaitheamh ar an nGaeilge, ar aistriúcháin go Gaeilge de chaipéisií oifigiúla is a leitheid, is caiteachas ar an nGaeilge é sin i súile an phobail, cuma cad é an buiséad stat seirbhíseach óna dtagann sé. Ní thuigim an cosaint tréan atá á dhéanamh ag daoine ar an mhaorláthas seo nuair atá páistí scoile ar an ngann chuid? Ní leanfar rud ar bith. Cuirfidh Fine Gael deireadh leis an Acht agus cinnte, caillfidh roinnt mhaith daoine obair aistriúcháin s’acu. Ach ní chuirfidh an Roinn Oideachais pingin sa bhreis do theascleabhair Gaeilge agus ní chuirfear pingin sa bhreis don Fhoras fa choinne irisí agus srl. Chomh maith leis sin, leanfaidh roinnt mhaith Gaeilgeoirí ar aghaidh ag iarraidh cothromas teangan a bhaint amach in Éirinn. Má gheilltear cearta teangan beidh sé iontach deacair iad a fháil ar ais. An ceart teangan é go gcuirfear airgead an cháiniocóra amú ar chaipéisí nach bhfuil ann ach ar mhaithe le ‘ceart teanga’ a chomhlíonadh agus páistí ag freastal ar ghaelscoileanna is scoileanna Gaeltachta atá gan téacsleabhair is acmhainní oideachais atá ar chomh chaighdeán lena gcomhionann i mBéarla? Más amhlaidh go séantar na leabhair seo ar mo phaistí, glacfaidh mé cás in éadan na Roinne agus feicfimid ansan cad is ceart teangan ceart ann. B’fhearr na h-aistritheoirí atá ag saothrú a slí beatha as seo a chur ag obair ar na téacsleabhair is eile. Tá fuiollach oibre ann ar shon na daoine seo. An rud mar gheall ar Fhine Gael, gur cheart do Gaeil labhairt leo agus a rá leo go bhfuil an córas mar atá bun oscionn agus gur gá é athrú. Má athraíonn FG é chun leasa na Gaeilge, maith go leor, gheobhaidh siad ár dtacaíocht. Mura n-athraíonn, séanfar an tacaíocht sin orthu. Feictear domsa go bhfuil meoin na teipe le sonrú id argóint. Amhail is go bhfuil tú ag rá nach féidir linn ach glacadh leis an rud a thugann an Stát dúinn gan é a cheistiú. Tá cumhacht againn agus beidh dealramh éigean lenár n-éileamh má deirimíd go bhfuil gá agus riachtanas i measc páistí scoile na tíre do na h-acmhainní seo seachas go bhfuil an cuma orainn go bhfuilimíd ag cosaint postanna aistritheoirí atá ag aistriú caipéisí go Gaeilge nach léitear fiú i mBéarla. Is mór m’amhras gur reachtaíodh Acht na dTeangacha Oifigiúla d’aon ghnó le cinntiú go gcuirfí an Ghaeilge chun báís tre soiniceas an phobail a threisiú i gcoinnibh na Gaeilge. Agus is cinnte gurb é sin an meoin atá ar chúl na bréaga seo atá á scaipeadh. Is cinnte, mar shampla, go bhfuair Colm McCarthy a mhí eolas faoi na caipéisí ón Roinn Airgeadais. Is cinnte go raibh rúnaíocht á chur ar fáíl ag an Roinn do – cén fath nár dúirt siad leis go raibh an tuairisc michruinn sa mhéid a dúirt sé faoin nGaeilge agus na caipéisí? Cén fath go deimhin? Ní h-iad FG an namhaid. Na stat seirbhísigh, sin iad na namhaid. Acu atá seilbh na liathróíde faoi láthair. Má táimid le seilbh na liathróide a fháíl ar ais beidh orainn imirt go cliste agus ciallaíonn sin breith macanta a thabhairt ar Acht na dTeangacha Oifigiúla é. Is é mo thuairim, mo bhreith, nach ar leas na teanga atá sé faoi lathair agus gur cheart feidhmiú na reachtaíochta a chur ar athló go dtí, abair, 2030, nuair a bheidh an 250,000 cainteoir laethúil Ghaeilge ann, mar atá beartaithe, agus ansan go mbeidh an t-éileamh ann do na seirbhísí cuí i nGaeilge. Idir an dhá linn, go n-aistreofaí roinnt caipéisí, an barr 10 is mó a lorgaitear i mbéarla a bheith ar fáíl i nGaeilge, agus go leagfaí an bhéim ar chumas labhartha na Gaeilge a spreagadh i measc na stat seirbhíseach. Níl gach stat seirbhíseach naimhdeach don teanga – ach is cinnte go bhfuil na boic sinsearacha. Ach is féidir le páiste scoile a fheiscint nach dtagann an t-airgead ón phóta Gaolainne. Is deacair a chreidiúint gur Gaeilgeoir atá ag cur locht ar chearta Gaeilge mar gheall ar pháiste a bheith gann. Cheapfá sin a léamh san indo!! Bhí fear ann ag dul don phort seo le bliantaí ar politics.ie, Darren Mac an Phríora, is léir anois go raibh tionchar aige. Shíl mise nach dtugann Gaeilgeoirí aird in aon chor ar na namhaid san Indo – chím go rabhas mí-cheart. Is é an fíor namhad don Ghaeilge an t-é a fhagfadh páiste scoile gann ar leabhair scoile agus ar acmhainní oideachais ar mhaithe le caipéisí a bheith aistrithe go Gaeilge nach léifidh an duine sin ach ar éigean. Ní ceart teangan é sin ach mícheart teangan…. Is é an fíór namhaid don Ghaeilge an t-é a sheasfaidh le na ‘mí-chearta teangan’ seo ar mhaithe le sciar bheag daoine a choimead ina bpostanna – ie na h-aistritheoirí – agus a bhfagfaidh droch chlú ar an nGaeilge i measc an phobail mhóir. 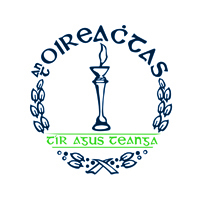 is dócha go bhfuil gach duine sa tír ag glacadh leis anois go mbeidh ciorraíthe sna séirbhisí poiblí a bhéas ar fáil dúinn feasta agus is é a fhearacht sin ag séirbhisí Gaeilge an stáit chomh maith.dar leat gur cheart do dhream éigin liosta de phríorachtaí a dhéanamh amach de na séirbhisí is mó tabhacht dúinn agus féachaint le hiad a chosaint.Muna ndéan lucht na Gaeilge an liosta is cinnte go ndéanfar dúinn é dar nainneoin. Cad bhur mbarúil de sheirbhisí nach bhfuil fíor riachtanach sa ghearr théarma? An tabhacht atá leis an Acht, ina n-iarrtar an bheagán aistriúcháin úd i measc go leor rudaí eile, ná go gcuireann sé iachall ar Stáitseibhísigh sinsearacha (namhaid na teangain dar leat féin, agus an cheart agat) an Ghaeilge a chuir san áireamh. Agus gurbh as a bpocaí féin (cinéal) a chaitheann siad íoc as sin. Creideann siad siúd a chuireann Tuarascáil Bhliaintúil amach gur cáipéis thábhachtach atá ann. Más féidir glacadh leis nach bhfuil leagan Ghaeilge de dhíth, níl an Ghaeilge tábhachtach. Sin an meoin a fhágann gan leabhra scoile muid. Tig leat iarracht a dhéanmah an dlí a chuir ar an Roinn – caillfidh tú do chás. Níl dualgas ar an Roinn leabhair scoile a chuir ar fáil. Tá dualgas ar an Roinn na siollabais a chuir ar fáil. Rinne siad neamhaird dá ndualgas leagan Ghaeilge a chuir ar fáil – go dtí go ndearna an Coimisinéir imscrúdú. Anois, ar a laghad, tá an bunábhar le leabhair scoile a chuir ar fáil ann. Ach má coilltear COGG ag MacCartháigh, ní bheidh na leabhair ann riamh. Armsa chath chun meon an Stáitseirbhís i léith na Gaeilge a athrú is ea an Acht. Mar sin, is ceart na scéalta áiféiseacha a cheistiú, agus gan géilleadh do fir tuí namhaid na Gaeilge. Cheapfainn go bhfuil dualgas ar an Roinn cloí leis an mBunreacht go bhfuil gach páíste cothrom os comhair an dlí. Agus más amhlaidh an scéal, is mura bhfuil an Roinn ag déanamh cinnte go bhfuil páistí atá ag freastal ar scoil ina bhfuil an Ghaeilge mar theanga teagaisc ann ag fáil na leabhair agus na h-acmhainní ar chomh chaighdeán lena gcomhionann i mBéarla, is cinnte go bhfuil spás ansan le h-aghaidh cás. Creidim gur thug Acht na dTeangacha Oifigiúla deis do stat seirbhísigh caitheamh anuas ar an nGaeilge le scéalta – cuid acu bréagach – ag cur in iúl go mbeadh na céadta milliún á chur amú ar an nGaeilge, staiseanóireacht is caipéisí is eile. Ach táímíd ag imirt ar a dtalamh nuair a bhímid ag tacú le ramhrú na maorláthach ar airgead na Gaeilge. Is feidir le na statseirbhísigh an locht a chur ar phobal na Gaeilge as an reachtaíocht mí mhorálta seo. Agus is iad san amháín atá ag baint leasa as.